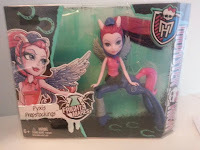 Mum of Five Staying Sane: REVIEW; NEW Monster High Fright-mares Pyxis Prepstockings Centaur toy. Half centaur, half unique monster mash up from Mattel Toys. REVIEW; NEW Monster High Fright-mares Pyxis Prepstockings Centaur toy. Half centaur, half unique monster mash up from Mattel Toys. We were recently sent a NEW Monster High Frightmares Centaur toy to review from Mattel toys. Monster High is filled with so many secret doors, passageways and portals you never know what you might find within its halls, or even within its walls- and deep within the catacombs of everyones favourite school live half centaur, half unique monsters! 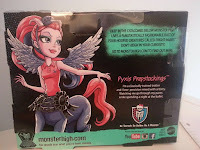 We received the one called Pyxis Prepstockings who is half pegasus and half centaur. There are 3 others in the collection called Frets Quartzmane who is part gargoyle and part centaur, Bay Tidechaser who a combination of seahorse and centaur and Aery Evenfall who is a mix of nightmare and centaur. The figures stand approx. 16cm high by 20cm long and have posable legs, arms and head. Pyxis Prepstockings is pink and purple in colour with pink and purple brushable hair. Part Pegasus and part centaur, Pyxis Prepstockings aims high and has the trophies to show it. This preppy polo player is gore-geous with a blue centaur body, silvery wings, a pink tail and horns peeking out of her pink and blue ombre-shaded hair. Ready to strike terror on the field, her accessories include silvery leg warmers, a black ribbon-adorned belt and a blue polo cap headpiece. Ghouls will love galloping into new worlds with this flawesome character! 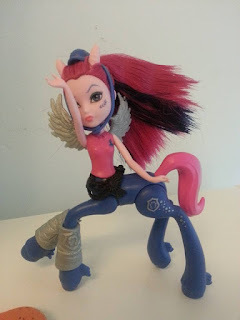 My daughter loves the Monster high dolls and so was keen to review the new Frightmares centaur toy. She loved the size of it, it wasn't overly big yet just the right size for role play and to include with her other Monster high dolls. She liked that it was posable and you could move the arms, legs and head too which meant there was more play involved as you could articulate the poses of the character more. There isn't as many smaller pieces as the Monster High dolls which is a bonus point from a parents point of view too. She found it easy to involve in role play along with her other dolls and she loved being able to pose them to display when not being played with too. 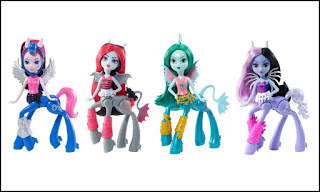 We would highly recommend these for any Monster High fan and are also ideal if your child is just getting into the whole fab Monster High toy adventure. 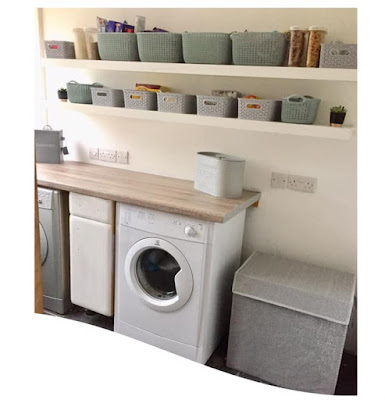 With four to collect and at a very reasonable price they are ideal gifts for Christmas that is just around the corner or birthday gifts for a friend. RRP for each doll is £11.99 and available at many toy retailers.